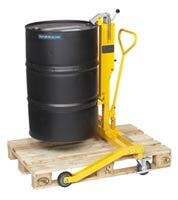 Drum Handlers are used to lift drums from floors, pallets, pallet racking & bunds. They can be used to lift & tilt drums to empty contents. Various types of chassis available, e.g. standard legs, wide straddle legs, over-rider legs & counterbalanced chassis. Finishes available are mild steel, stainless steel & galvanised. Manually or battery operated versions available. Suitable for all types of drums, e.g. Steel, “L” ring Plastic, Fibre & Mauser Egg Shaped. The WARRIOR DRUM HANDLER OVERIDER DTR250 has a wide straddle and a cantilevered frame which allows it to pass over an 800mm max wide pallet allowing drums to be manoeuvred both on and off with ease. 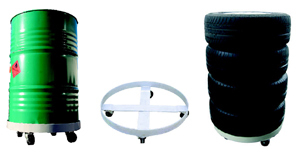 The unit is exceptionally easy to operate, gliding along on large polyurethane wheels. Having a combination of wide straddle and cantilevered chassis also enables the DTR250 to lift drums off corners of spillage containment areas. 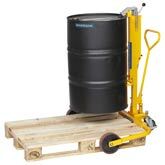 WARRIOR Drum Handler Handler PLUS will handle 201 litre drums on and off bund pallets aswell as regular pallets. 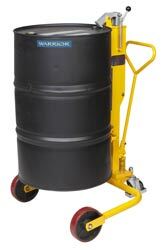 WARRIOR Drum Caddy will handle 140/210 litre steel/plastic drums. Removable handle is used to tilt drums for positioning and doubles up as a bung key. 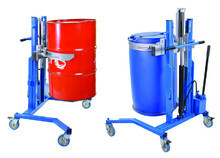 The drum lifters are designed for handling 200 litre steel drums. They lock the barrel automatically while lifting. They can lift drums in and out from almost any lorry or van. Simple lift with a foot pedal and lowering with a dead man’s handle. 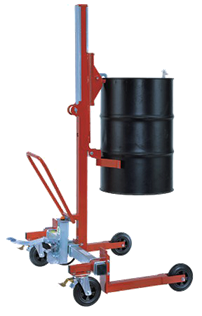 For handling barrels, tires or other loads with a circular bottom. Welded steel structure. High stability. 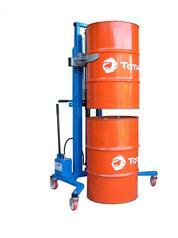 Drum cradle with four wheels for safe transport and storage of 200 litre steel drums. Clamp on the handle to lock the barrel to the carriage. Drum loading truck for transport and loading on and off pallets. All of the grip height is adjustable to fit different sizes of steel drum. Smart pedal support makes it simple, easy ans safe to move the truck and drum in to the transport position. This drum depalletiser has a counterweight in the box at the back of the unit. This allows it to be used for lifting drums and barrels without the need of support legs sticking out the front of the unit. These are generally used for taking drums off pallets and lifting them into dispensing machines that have no access for wheels to go around or under. The universal stainless steel drum grip is designed for lifting steel or plastic drums and barrels from 50 to 205 litres. We have fitted the highest quality wheels with precision bearings to ensure that the unit is easy to push. The rear handle operates the tiller steering on both rear wheels. We would recommend this unit for operating on level floors. The steel chassis is grit blasted and powder coated to give a tough long lasting finish. The drum is lifted using a double acting hydraulic hand pump. This is easy and quick to use. The unit is also available in full stainless steel including an electro polished finish for GMP areas. Both the steel and stainless steel drum lifting units can be supplied for ATEX Rated areas. 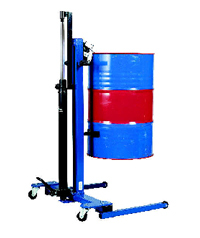 The corner depalletiser is specifically designed for lifting and moving drums and barrels from pallets in areas where the width of the unit is an issue. 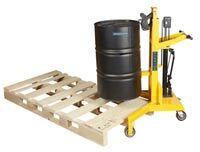 This drum mover can only reach the drums placed at the four corners of a pallet; therefore it requires access to all sides of the pallet which can mean a larger area is required or a pallet truck may be needed to move the pallet for access. 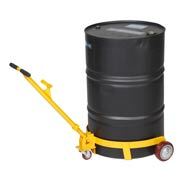 It allows the safe handling and transportation of drums and barrels from 50-205 litres. 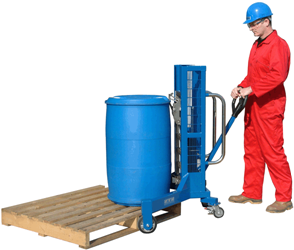 Different height options are available for the drum mover to suit the pallet or bund height. 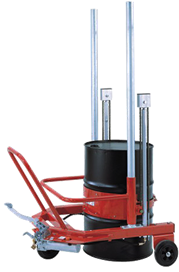 The drum gripper is a robust device designed for lifting and transporting 200 l steel drums. The gripping mechanism also holds the drum securely during transport. Supplied with additional set of wheels with Ø 70 mm to allow the drum gripper to be driven under pallets. 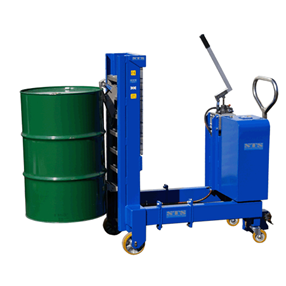 The FB 1400 drum lifter is a specially designed lift and tipping device for handling rolling hoop drums. 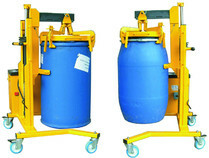 The FB1400 drum lifter is wheeled to a standing drum which is then clamped into the drum basket. Using the hydraulic foot pump the drum is raised to the required height. This makes it easy to transport, lift, tip, mix and empty drums. 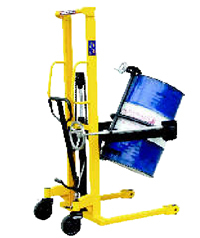 The FB 1400 P drum lifter is a version with additional features. 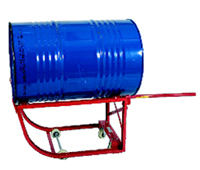 It is designed for handling steel and plastic drums of different diameters.